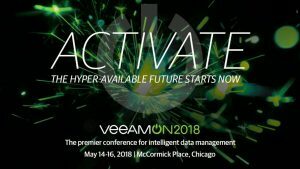 As we tick over the 30 days till the VeeamON event which will be held in Chicago this year, I wanted to share some of the stuff that we can expect to see over the week for those attending or for those thinking of attending. Here is a rolling countdown to when things will be kicking of in style over in Chicago. The first thing I want to mention is something you may want to get involved with before VeeamON and that’s tell us something that you have been doing with Veeam that is not out of the box behaviour, are you a service provider doing something that puts you in front of the others, using CEPH as you backup as a service repository, have your own equivalent to the AWS Snowball to securely seed data in. I should probably stop there before I give too many secrets away. If you do though then you can submit or nominate someone for the Veeam Innovation Award here. When I arrived last year in New Orleans for VeeamON 2017 I was amazed by the volume of people who were there early to attend the VMCE training that happened pre event last year. There were hundreds of people. I know why now as well it’s because the training plus VeeamON ticket is nowhere near the cost if you were to take the training at home so why not tag on for the event as well. For those out there that have maybe sat the 3 day course but have not yet taken or passed the VMCE exam there will be a day refresher course happening on the Monday, with the ability to take the test on site as well at the pop up on site Pearson Vue testing centre. The main VMCE based on 9.5 update 3 will also be on offer, but instead of this happening at the start of the week this year, it will finish that week off running from the Thursday through to Saturday. The VMCE-ADO, the Advanced Design and Optimisation course which is a two-day experience will be running on the Thursday and Friday. Finally we have the VMCE-Orchestrator course, this is new and if you hadn’t guessed it’s focused on the newly released Veeam Availability Orchestrator. It will cover deployment, configuration and management of the product and this will run on the Thursday and Friday. Now it would not be right of me if I didn’t give my own sessions and fellow teams session a shout out so here goes. Cooking up some Veeam Deployment with CHEF automation (May 16) – this is one of mine, and it’s not a cookery lesson, well maybe it is in some ways, it’s there to show the ability to use CHEF to automate the scalable deployment of Veeam in a large enterprise environment. Finally to say I hope to see lots of you there. I am all booked up and can’t wait for a great week in Chicago, with the full intention of trying as much pizza as possible.